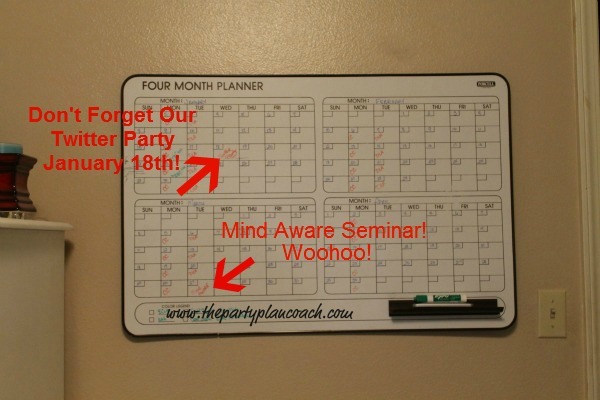 Over the weekend I was a bit scarce on Party Plan Divas, but with good reason. On Saturday we decided to revamp the house, move some rooms around, and set me up with a brand new office for 2012. I can not TELL you how excited I am. There is just something about a “new space” that makes you feel energized,rejuvenated, and ready to take on the world! 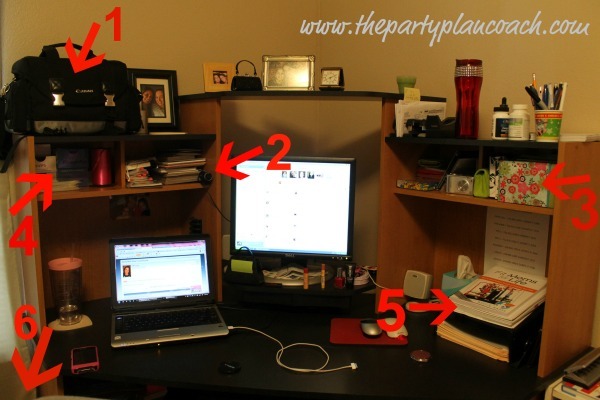 By request from a few of my Divas, I am taking you on the “tour” to show you where I work each day, and how I keep my life, time, schedule, and space organized. 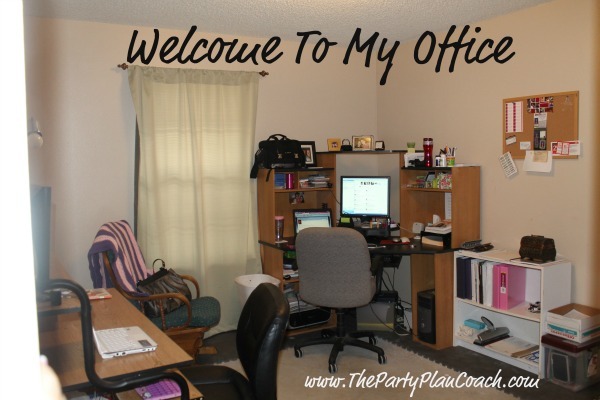 Welcome to my office! One of my favorite tools that I have had for years is my four-month dry erase calendar. It is pretty large so you can write in just about anything you need, but I love being able to see my next four months “at a glance” at any time. It is on the wall directly behind my office, so I can spin around and see it any time. It was a little pricey, but has been worth every penny! Next is this amazing hutch that my mother in law gave me. It “hides” a television, so I can watch tv when I am working alone (gotta have some sound) but close it for a great background for when I am recording videos. 1 – it also holds my weights and exercise equipment for when the mood strikes for some curls. 2- Books I love and gain inspiration from. You can see my Top Ten list here. 3 – My Gold Canyon warmer and pod I received as a gift from one of my Divas. Currently rockin “Pool Towel” – the scent that reminds me of summer – even when it is chilly outside. 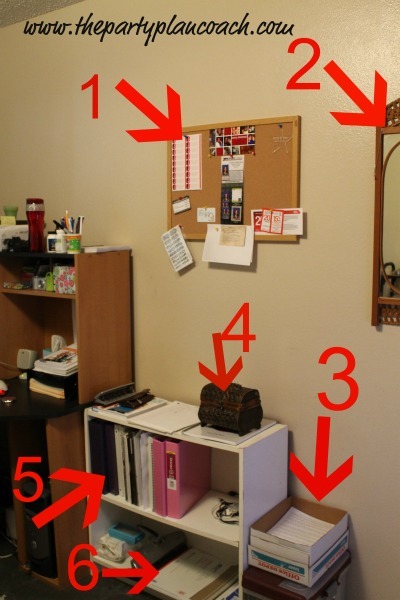 1 – my corkboard of important stuff – includes my voters registration card, Office Depot coupons, items I need to order, etc. 2 – a mirror… of course. 3 – my “take to the car” pile. Includes my Mobile Office and things that need to go to Office Depot to be copied. 4 – cute little box of dry erase markers in over 10 different colors – a MUST have. Color is everything. 5 – my brain (lol) includes binders for Conference Calls, Diva Success Sisters Chapters, Diva Leadership Academy notes, Direct Sales News magazines, etc. Also has my random wires to connect my camera, phone, iPod, etc. 6 – shipping items, a huge hole punch, and items that need to be returned to my Corporate Office. Then of course the nucleus of it all…. the desk. 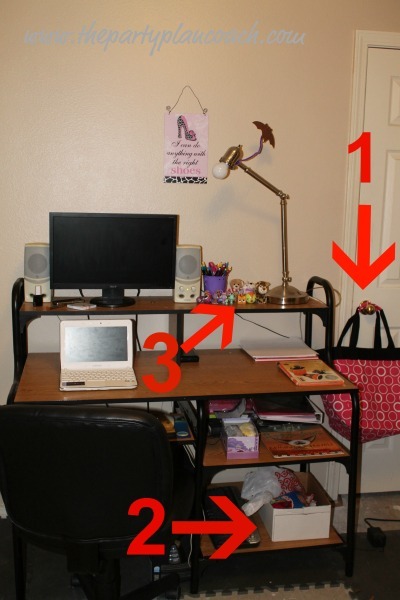 I love love love love this leveled corner desk that I purchased years ago from Target, but I believe that Office Depot has them as well. It is huge, but truly perfect. It gives space for all of my “stuff” while still having plenty of room to write or spread stuff out to make Gardening Gifts. Truly worth whatever they are asking for it. 1 – camera bag that houses my Canon T3 Rebel with all of its lenses. 5 – my current “to do today” pile – includes a book I need to review and my Executive Size Diva Success System Planner. Also has extra file folders for me to grab in a hurry. 6 – a trash can. My best friend. I have to tell you – I fill this thing up at least twice a week. Truth is we hang on to so much crap we just simply do not need. If you havent used it since Halloween – throw it away. If you have to dust it off to pick it up – throw it away. If it is papers – scan them in to your computer and then throw it away. Clutter is TERRIBLE for productivity. Just throw it away. If you need it again, make the money to buy it again – but I bet you wont need it! My Tween daughter also moved her desk in here, along with her computer and school stuff. It has been great to do homework and such with both girls here in the office together. They know this is a “work room” and not a “play room” and have been great about keeping things tidy and put away. 1 – my 31 Gifts everything bag. It kind of accompanies my “take to the car” pile. 2 – crafts, crayons, glue sticks and other fun stuff that is for my girls, but I use from time to time for fun activities such as a Vision Board. The only thing that I forgot to take a picture of is the bottom of my desk – where there is space for my file cabinet, computer tower, and printer. I also have my past Planners and a bag of mini hand sanitizers for gardening gifts. So that is it! That is my office! 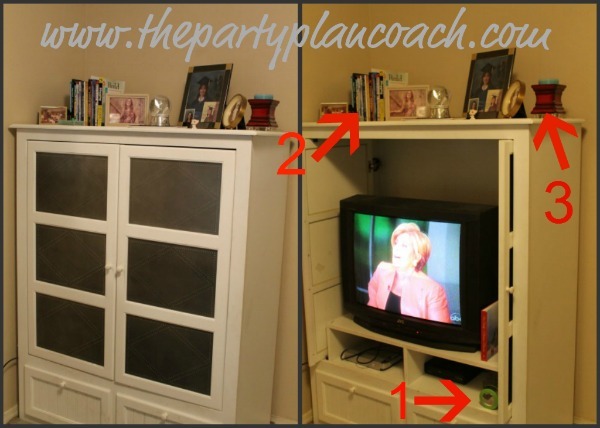 Thanks for taking the “tour” and I hope I gave you some ideas for organizing your space to help you be more organized and successful in the New Year! If you have any questions let me know! I hope to be chatting with YOU (either in person or on Skype!) from this office very soon!